Cassava (kamoteng-kahoy in Tagalog) is the third largest source of carbohydrates in the world. Among crop plants, the cassava plant provides the highest yield of food energy and is a staple food for more than 500 million people. Cassava root is very rich in starch and contains significant amounts of calcium, dietary fiber, iron, manganese, phosphorus, potassium, vitamin B6 and vitamin C.
A recent study conducted in the Philippines (one of the countries where cassava is an important crop) looked into the effects of root crops and legumes in lowering cholesterol levels among humans with moderately-raised cholesterol levels. The study showed that cassava significantly decreased total cholesterol levels, decreased low density lipoprotein (LDL) cholesterol (considered as “bad” cholesterol), and may help lower triglyceride levels due to its high total dietary fiber content. Other studies show that cassava may help support the nervous system and help alleviate stress, anxiety and irritable bowel syndrome. Beside as a food, cassava also has many benefits as a drug, such as for rheumatic, headache, fever, wounds, diarrhea, intestinal worms, dysentery, night blindness, beri-beri, and also can increase stamina. Overcoming arthritis can be done by eating the cassava or rub it on the pain area. Cassava is included as the country’s major crops under the Agri-Pinoy Corn Program and is also identified under the DA’s Food Staple Sufficiency Program as an alternative for rice to minimize rice importation. 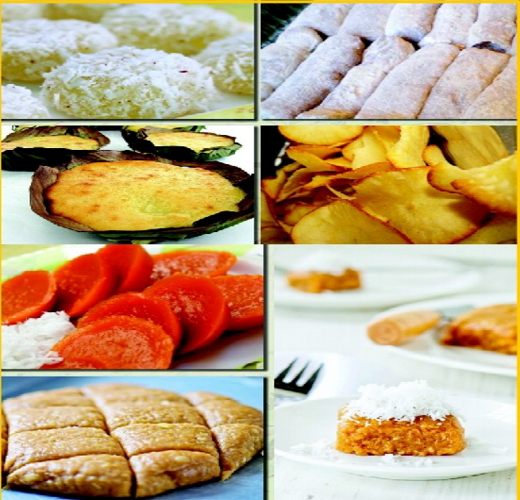 Cassava Recipes for you to try. Prepare local steamer using the following materials, milk can (powdered milk) bao ng niyog divided into 2 using the sides with hole, grated cassava and water. Place the bao ng niyog to sit on top of the milk can and seal with grated cassava moist in water, allow to dry before using. Pulverize pressed grated cassava and allow to air dry for 30 min to 1 hour. Set aside. Fill the steamer with water until it boils. Place the grated cassava enough to cover the baong niyog then cover with banana leaves, invert the steamed cassava until both sides are cooked. Remove from the steamer and allow the piyutu to roll in grated coconut. Divide into bite size. Wash the cassava properly, peel and slice according to the desired sized. Wash the rice. Add water using the 1 cup rice: 1 cup water ratio. Mix rice and cassava. Boil until rice is cooked. Cut the leaves. Sprinkle with salt and squeeze well to extract it out. Discard remaining juice and wash the leaves with clean water. Put it in a clean pot and put the ingredients except coconut milk. Add three cups of water. Boil until tender leaves. Place the coconut milk. Flavor according to the desired taste. Cassava leaves was boiled, squeezed until the water out, then cut into pieces. Mix the cassava leaves with tofu that has been crushed, stirring until blended. Give cassava leaves with spices that have been mashed, stir well. Cassava leaf shape into circle balls for ball pimpong, fist. Do it until the dough runs out. Prepare a thin flour, then give the spices a little. Dip the leaves of cassava into the flour. Fry in hot oil until yellowish. Remove and serve hot. Mix well cassava, wheat flour and coconut, set aside. Using electric mixer, mix eggs whites and half of sugar until firm, stop the mixer. Use the wooden spoon, mix with the cassava mixture until smooth, add the stiffed egg white and mix well. Put the dough into greased porcelain cups, fill ¾ of each cup, steam for 10 minutes, pour with sauce and sprinkle with dried shrimp, let cool and remove from the cups to serve. • To make sauce: mix all spices bring to boil and stir well. • To make dried shrimp sprinkle: blend chili, garlic and sugar into a paste, put oil in a pan, then sauté the paste, add the shrimp, continue sautéing until golden brown. Over medium heat, cook cassava and coconut milk until they form a thick mixture. Add sugar and grated coconut. Remove from heat. Put about 2 tbsp of the mixture on a banana leaf. Wrap tightly to make each suman, either in the shape of a square or a roll. Steam the suman for about 15 minutes, or until each one is firm when touched. Peel the cassava, cut crosswise into pieces, wash and drain. Dissolve salt in water in a sunken container. Fry cassava until cooked but still pale, raise, directly enter into the salt water solution, allow 5 minutes. When cassava is blooming, remove from brine, fry again until yellowish. While still warm, sprinkle with sweetened condensed milk, powdered flavorings french fries, and grated cheddar cheese. Serve. Mix all the ingredients in a bowl. Roll to form dough. Spread and flatten the dough thinly, then cut to form squares (3 inch squares). Roll each square with desired filling (hotdog, cheese, caramel). Fry until golden brown. Serve hot. Roast cassava grates and cassava flour then let cool. In a sauce pan or carajay, mix the coconut milk, brown sugar, glucose, and buko strips. Cook over medium fire. When the mixture boils, add the vanilla. At this time, lower the fire, then add the roasted grates. Stir constantly for 15-20 minutes or until the desired consistency in achieved. Cool the mixture then roll into desired espasol sizes. Before serving, dredge the espasol roll with the roasted cassava flour. Combine the cassava, onion, and herbs. Lightly beat the egg and add to the cassava mixture and combine until smooth. Form mixture into small balls. Lightly fry the balls in the cooking oil, over medium temperature, until golden brown. Note: A finely chopped fresh chili pepper or a clove of minced garlic can be used instead of the herbs. Peel the cassava and then divide each cassava root into 4 thick strips (1 cassava roof serves four). Lay them in a large pile on baking tray. Bring a pot of salt water to a boil and then add the cut cassava. Boil for about 30 minutes. Remove from the stove and drain all the liquid. Add all other ingredients and mix thoroughly. Preheat oven to 400°F. Bake for 15-20 minutes or until golden brown. • Serve them hot of the oven as an appetizer. • This is street food at its best. Served with chili sauce these tasty fries are bursting with flavor. • They also make a nice side dish with a burger or some other protein. Combine all the ingredients, and pound once more. Mix till well blended. Arrange on a platter and cut into desired shapes. Mix sugar and butter until smooth. Add cassava, macapuno, coconut milk and vanilla. Stir together. Bake in 350°F oven for 30 minutes or until cooked. Pour condensed milk on top of cassava cake. Sprinkle grated cheese on top. Put back in oven top shelf until brown. Peel the Cassava Roots and cut them into pieces about 7cm long. Wash and then dry the Cassava pieces. Use large saucepans add the water and the sugar and bring to the boil over a medium heat until all the sugar dissolves. Add the Cassava root pieces and continue boiling over a low heat until the cassava is cooked through and fully caramelized. Let them cook for about 2 hours. Remove from the heat and then transfer it to the serving dish. And serve either hot or cold. Heat oil in pan then add cassava. Deep fry for 2 minutes. Pour in the sugar and wait until it caramelizes, once the sugar melts give it a good mix so that the cassava pieces will be coated with the melted sugar. Using a slotted spoon, remove cassava pieces, cool in a wire rack then serve. Combine all ingredients, except the coconut. Pour into 2-9 round pans. Steam for 45 minutes or until set. Cool. Form into balls, then roll in grated coconut. Note: To make pandan water, boil the leaves from 4 pandan stalks in 2 cups of water until fragrant. Cool. Beat eggs and sugar till lemon colored. Add the rest of the ingredients. Pour into a greased 9×9 inches pan lined with banana leaves. Mix coconut milk with the flour. Add condensed milk and cook over medium heat till thick. Add egg yolks and mix well. Return to heat and cook 5 minutes more. Pour over baked bibingka. Sprinkle with the grated cheese and broil till golden brown. For coconut syrup, cook thick coconut milk over medium heat. Stir constantly until oil comes out and “latik” or coconut residue forms. Cool until “latik” turns brown. Set aside. Cook thin coconut milk and bring to boil. Add one panutsa. Stir continuously until thick then add the “latik”. Set aside. For pancakes, beat egg and stir in evaporated milk and sugar. Blend well. Add cassava and pour melted butter or margarine. Cook batter in a griddle 1/3 cup batter per pancake. Serve with “Pulot at Latik”. Combine brown sugar and 1 cup of the grated coconut and cassava. Put approximately 3/4 cup of the cassava mixture in the coconut shell and cover with aluminum foil. Steam for 15 minutes until cooked. Unmold to a serving dish and cover with foil while making the rest of the puto. For the topping: Add the water to the remaining grated coconut and extract the coconut milk. Combine condensed milk and coconut milk in a small saucepan. Cook over medium heat, stirring constantly, until thick. Pour mixture on top of the puto. Sprinkle pinipig-coconut mixture on top. Serve warm. a pot with 2 inches of oil heated to 3500 C and deep fry golden brown. Drain and season with salt and pepper. Wash the cassava, peel and grate. Remove excess juice. Mix together in a bowl all the dry ingredients. Add cassava and 2 tbsp oil. Mix well. With the aid of 2 knives, cut the dough fine into sizes like mongo seeds. Add water and knead well. Spread the flour on the board and flatten the dough with the aid of a rolling pin. If necessary, add more flour to facilitate dough flattening. Cut up the flattened dough into thin sizes shape into rolls similar to cigarette sticks. Arrange them in a baking pan and cook in oven. Remove the baking pan and cool. Remove the “sticks” from the pan with the aid of a knife. Seal in a plastic bag and label or serve. Boil cassava and 5 eggs in salted water for about 25 to 30 mins until cassava is fork tender, drain. Mash cassava until smooth, take out the lumpy bits that cannot be mashed. Peel the eggs and set aside. Add 1 raw egg, butter, salt and pepper to the cassava, mix well. For egg balls, cover the eggs with the cassava to form a ball. The egg should be completely covered by the cassava mixture. Roll in flour and fry until golden brown. Serve these with mango chutney. Boil 4 cups of water. When it has boiled, add the cassava pieces, pandan leaves, and sugar. Turn the heat to medium. Cook till the cassava is soft but still firm, then turn the heat to low. Add the coconut milk and tapioca pearls and continue cooking until the pearls are midway transparent. Add the sweet banana and cook till the tapioca pearls are completely transparent. Adjust sweetness to taste. Turn off the heat and serve. In a medium pot, add cassava to 6 cups boiling water. Cook for about 15 minutes or until slightly soft. Leave the cassava in the water to stay hot. In separate medium pot, heat the oil over medium heat. Add the garlic and cook until just beginning to brown. Do not let burn. Add the lime juice and broth to the pot. Boil sauce for 2 minutes. Add salt and pepper to taste. Drain the cassava. Place cassava on a plate, and put onion slices on top. Pour the sauce over the onions and cassava. Serve. Boil the cassava in salted water then knead (mashed cassava). Add margarine, grated cheese, milk and eggs. In a saucepan, fry the onion in oil add the filling ingredient. Season it to taste. Then, in an ovenproof greased container, place half the dough (cassava mixture), add the filling on top and cover with remaining cassava mixture. Sprinkle the cheese and bake at medium temperature (180oC) for 15 minutes. Dissolve brown sugar in ½ cup of water. Add tapioca pearls and set aside. Steam cut up cassava until tender. Heat a small pot, dissolve the white sugar in water. Simmer until it turns into simple syrup. Add cassava and mix well until cassava is coated with syrup. Serve with the sweetened tapioca pearls. Clean the peeled cassava, then grate. Mix together the cassava and all ingredients. Mix well until it becomes a thick paste. Spread thinly and evenly over a banana leaf or aluminum tray. Steam for about 5 minutes. Remove from steamer, place on chopping board and cut into sizes, about 4 x 1½ cm. Remove the sliced pieces and arrange in a perforated tray. Dry under the sun or dry until crispy. Place butter, brown sugar and ½ cup syrup of the canned fruits in a deep baking pan. Place over slow fire until brown sugar is melted. Remove from the fire. Arrange fruits in the pan. Separate the yolks from whites of eggs. Beat egg whites with ½ cup sugar until stiff. Beat egg yolk until fluffy adding the other half of the sugar and two (2) tablespoons of water with calamansi juice. Beat both mixtures together. Fold in flour. Pour butter over fruit in pan. Bake in moderate oven. When done, turn upside down on cake plate. In a mixing bowl, blend all the ingredients until thoroughly fine. Pour into cuchinta molders or ungreased muffin tins. Steam for 5 to 20 minutes. Let it cool for 5 minutes and remove from pans. Serve with grated coconut. Sift flour separately; measure mix and add baking powder. Sift three (3) times. Cream butter, add sugar. When fine, beat in the egg yolk one at a time. Cream well until fine and fluffy. Add sifted flour mixture alternately with milk. Fold well-beaten egg whites in the butter mixture. Pour in well-greased nine (9) inch baking pans. Bake for 20-25 minutes. Sift cassava flour and baking powder. Mix with pinipig. Cream margarine and sugar. Add eggs one at a time. Continue creaming until all eggs have been added. Add flour mixture and mix well. Add vanilla. Drop by teaspoon on greased cookie sheets. Bake until brown at 177oC (350oF). Toast cassava flour to light brown. Mix sugar and powdered milk. Melt butter and add to the mixture. Mix thoroughly and mold in polvoron molder. Wrap individually in cellophane and serve. I read the article but I got some doubts. Who are overweight try this diet.